5-1/4" from tip to tip. R1: With Red, Ch5, dc in 5th ch from hook. (Ch1, dc in same ch) 9 times. Ch 1. Join with sl st in 4th ch of beg ch-5. R2: Attach green in any ch-1 sp. Ch10, sc in same sp. Sc in next dc. *(Sc, ch10, sc) in next ch-1 sp. Sc in next dc. Rep from * around. Join with sl st at base of first ch-10. R3: Working with 2 of the ch-10 loops at a time. Place the left ch-10 loop over the right ch-10 loop and work through the center of both loops. Attach yarn, ch4. (dc, ch1) 4 times. Dc in same sp. (shell made) Sk next sc. Sc in next sc. Sk next sc. *Holding next two ch-10 loops with the left loop over the right loop. (dc, ch1) 5 times. Dc in same sp. (shell made) Sk next sc. Sc in next sc. Sk next sc. Fep from * around. Join with sl st. Do Not Fasten Off. Do Not Turn. EDGE: Sl st in ea dc and ch-sp around, placing (sl st, ch2, sl st) in the center ch-sp of ea shell. Join with sl st.
Use a strand of yarn to add hanger to the top of one of the star points. 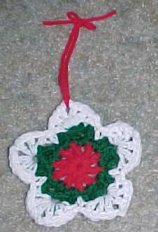 Use this same pattern without the hanger for a great Christmas Coaster. Use Red, White and Blue for Independence Day.